There’s a plan afoot in Hollywood to influence minds. No, the secular humanists aren’t behind it. This time devote Christians hope to use the media of movies and television to promote their viewpoints –- by working inside the great beast. 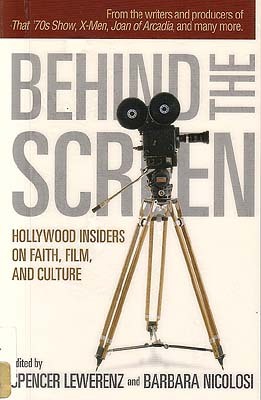 Details can be found in a series of essays collected in the book, Behind The Screen: Hollywood Insiders On Faith, Film, and Culture, edited by Spencer Lewerenz and Barbara Nicolosi. In the introduction the editors explain how Act One, a nonprofit program, was created to train “artist-apostles,” believers in Jesus who would try to transform, not take over, Hollywood. Behind The Screen promotes the opinion that angry letters and boycotts don’t work against the studios. Hating and ignoring Hollywood only allows it to produce more unChristian trash. Instead, the staff and graduates of Act One hope to subtly influence the creative process, increasing the chances of more uplifting and positive entertainment to be produced. But when I think of horror movies –- the intense, graphic horrors on the screen today –- I don’t associate them with uplifting themes. But Scott Derrickson in his essay says that as a Christian he feels compelled to deal with the dark side of existence. That’s why he was involved with such movies as Urban Legends: Final Cut and Hellraiser: Inferno. The main point behind Act One is that most people go to mainstream movies; that’s where the numbers are. There are movies targeted at Christian audiences such as The Omega Code and Carmen: The Champion, but they appeal to Christians only and most of them aren’t that well made. Also, nonbelievers are put off by strong messages in overtly Christian films. People don’t want to be lectured. In his essay Scott Derrickson advises the Christian artist to belong to the Quality Club. A Christian doesn’t have to agree with everything promulgated by Hollywood, but he must succeed in the business or lose the opportunity to share his faith in the mission field of Tinseltown. A key rule of the Quality Club is moral integrity, servicing your employer to the best of your ability. What Act One seems to offer is a way to render unto Caesar the things which are Caesar’s –- while also letting Caesar render unto apostle-artists a great paycheck and maybe –- maybe –- the chance to bring someone to Jesus. It’s like a Christian being paid to play the piano in a brothel. He hates all the sin around him, but if he slips in an inspirational song now and then, someone might pause from screwing or being screwed and find their way to God. Until the cops raid the joint and shut it down. The scientist had the look of eagles in his eyes. No, Dan Brown didn’t write that last sentence –- even though I wouldn’t be surprised if he had. I’m amazed how many people think Dan Brown is such a good writer. Sorry, I ain’t buying. 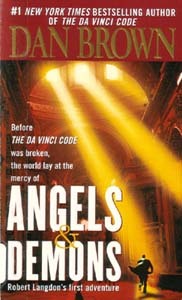 Yup, Angels & Demons and The Da Vinci Code are both best sellers. But because something is popular doesn’t mean it can hold up to some scrutiny. I enjoy a good story; there’s nothing wrong with great entertainment. But because something is “entertainment” doesn’t mean that its crappy flaws have to be excused. Intro To Creative Writing -- Rule #1: Never stoop to having your character conveniently look into a mirror and describe himself in detail to the reader. Brown does this both of his books, right in the opening scenes, to introduce his hero. In The Da Vinci Code he also has one of the villains study his reflection in an airplane window for the benefit of the reader. A good writer can bring a character to life without the character obsessing with his looks in a reflection. When Brown writes his autobiography, maybe he’ll have a mirror hanging over his computer. Besides the mirror cheat, Brown evinces hackism by overwriting at times. For example, his description of a French police inspector investigating the murder scene in The Da Vinci Code. The inspector stands there with shoulders thrown back, his chin buried into his chest. What happened? Was this inspector walking down a Parisian street when someone defenestrated a small safe from the fifth floor, hitting said inspector on the back of his head? Shoulders thrown back, chin in chest. Try it. In front of a mirror. Hurts, don’t it? How stupid do you look? That stupid, huh? I don’t remember if the inspector ever stood with his arms akimbo. If he did, he would’ve blown apart from the extreme tension. OK, if the blast accelerated at an “incomprehensible speed,” would it have time to “gobble” up the dark? Wouldn’t it simply obliterate the night in an instant? A fast-slow explosion. Sounds oxymoronic. Or at least turgid. But not as turgid as the term “burgeoning fiend.” Is that anything like a flourishing imp? A budding boogeyman? A sprouting sprite? But Dan Brown doesn’t have to worry. He can produce rough patches of purple prose in his novels and still make the bestseller lists. After all, he has the look of dollar signs in his eyes. Apparently Richard C. Hoagland has never encountered a dot he couldn’t connect. One key point in his theory is the face on Mars. Back in 1976 a NASA space probe photographed a section of Mars where it seemed a giant face was staring up into the sky. Was this a monument, evidence left behind by alien beings? More photos taken in 2002 by another satellite proved that the “structure” was an illusion created by natural features and the play of light and shadow. But Hoagland couldn’t accept that answer. In the 1976 photo the face looked manlike and Hoagland claimed that it indeed had humanoid features. But when the 2002 images showed the manlike features weren’t really there, Hoagland backtracked a bit and said he never claimed what would be revealed by clearer images would prove to be an exact match to a human face. But Hoagland has a way of making the dots connect after the fact. Sometimes he doesn’t tie A with B; he just skips most of the alphabet and goes right to Z. The pyramid shape is fairly common on earth, whether it be manmade or natural. After a satellite image suggested a pyramid structure on Mars, Hoagland worked backwards, trying to find conspiratorial evidence with anything pyramidal. 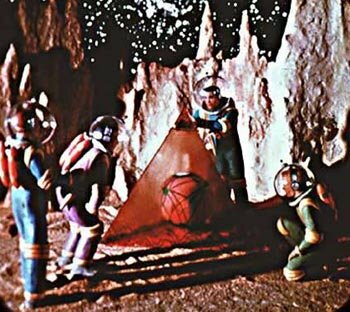 When he came across a Martian pyramid in a “Tom Corbett, Space Cadet” SF story from old View Master reels, then he had to connect that dot, it wasn’t a coincidence. So why would the conspirators behind the great cover-up put a clue to such a Martian structure in a kid’s story from the 1950s? You got me. "But -- eighteen years before the rest of us would see (from Viking 1) what was waiting for the Human Race on Mars …. "So, in 1958 … how did Kirby know?!" 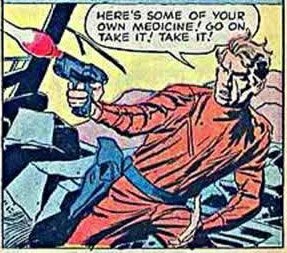 "So, how does a lowly 'comic artist' in the 1950’s become privy to the Greatest Secret in the History of Man … before it could be known?! "So -- if he didn’t get his information from “Tom Corbett,” regarding “ruins of an ancient, war-torn civilization on the planet Mars … presided over by a giant head …” -- how did Jack Kirby know about “the Face!? "The answers’ [sic] obvious: he was simply told." Jack Kirby –- who co-created many of the famous Marvel superheroes like the Fantastic Four –- had a great imagination. Kirby dreamt up many comic book stories during his long career. With such a body of work, it’s probable that one of his ideas would coincide with some event in real life, especially after time marched on. By chance the Mars Orbiter in 1972 happened to fly over a certain area of Mars when the light and shadows visually transformed part of the surface into a manlike face. There’s no need to deduce that the face on Mars is an artificial construct and that some mysterious insiders let Kirby know about the face years before it was photographed. Once again: if you’re trying to keep hidden knowledge hidden, then why reveal in a story for kids? And once again: You got me. Maybe Hoagland is part of another conspiracy to spread disinformation, a dupe keeping the truth hidden from the masses by making silly claims that obscure the real story. Anyone can selectively connect dots, can't they?